If you wanna try ﻿Lithuanian food at it's best - this is where to find it. 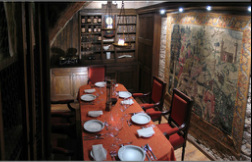 In a labyrinth of a cellar, with many authentic decorated halls, you can be sure to taste the best of what t﻿he Lithuanian kitchen has to offer. A wide range of game dishes is also to be found on the menu of Zemaiciu Smukle. Skanaus! (Enjoy Your meal!). The most picturesque surroundings you can imagine. 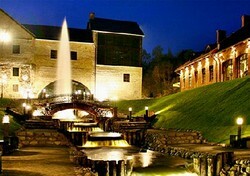 A old water mill turned into a fantastic resort with numerous restaurants and activities. Both interior and exterior gives a good impression of how buildings looked like 200 years ago in Vilnius. Traditional Italian food when it doesn't get any better! 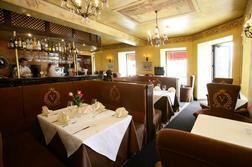 In real Italian surrounding you can expect to get a meal You soon will forget. Fresh products are turned into magnificient dishes by the Italian chef. Buon appetito! 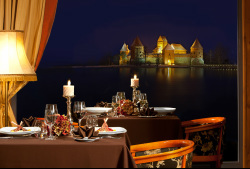 A menu of ostentatious French fare alongside more traditional Lithuanian offerings, white tablecloths and a splendid view of the Castle add up to make the Round Table Club the town’s most sought-after address. The warmer months herald the opening of a charming terrace on the lake. The menu is a roll-call of posh-sounding food including a dedicated champagne menu.